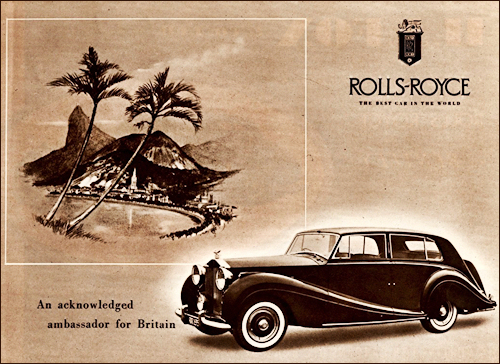 Rolls-Royce Silver Wraith in common with the export-only Silver Dawn and the Mark VI Bentley is fitted with the larger (4566-cc) engine for 1952. Various catalogued bodies are available. 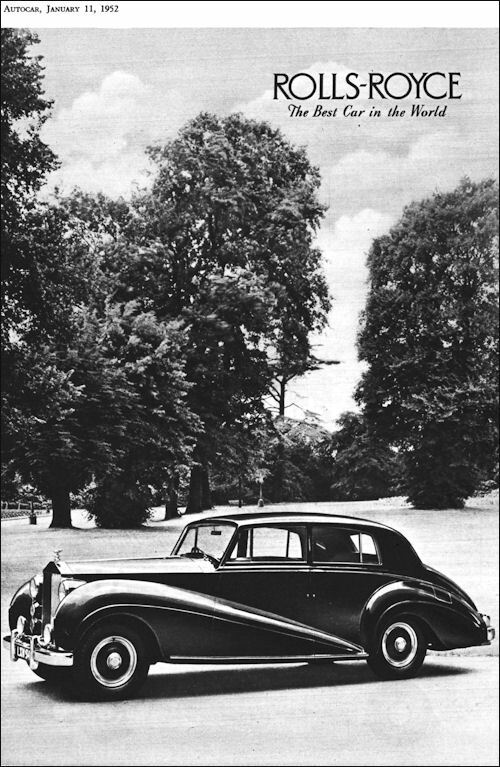 From 1952 Silver Wraith has longer body as on R type Bentley and 150 bhp 4566cc engine, and auto option. 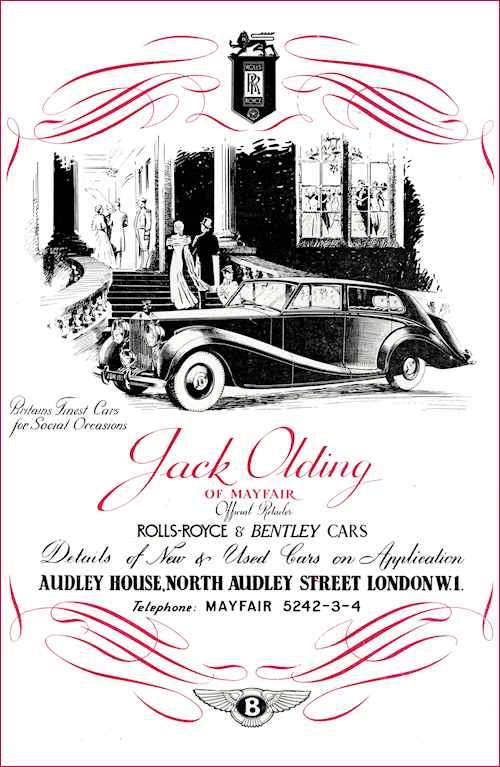 The modified body and extended frame described in connection with the new Bentley cars also find a place on the Rolls-Royce Silver Dawn model which continues otherwise unchanged as do the longer wheelbase Silver Wraith models. 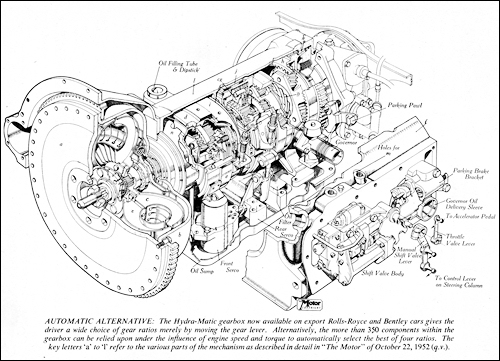 As with Bentley, so with Rolls-Royce, however, the left-hand drive models sold in hard currency export markets are now available with the Hydra-Matic transmission originally developed by General Motors Corporation. The installation of this transmission has been fitted in conjunction with the transmission servo-motor in the brake system and the oil pump for the ride control shock absorbers which are well known and established Rolls-Royce features. The technicalities of the new box are discussed in a separate chapter of this year's "The Motor" Year Book. All automatic schemes have the inherent disadvantage that they cannot weigh the future, and the gear change must therefore be made subsequent and not prior to the event. It seems therefore that the logical European system will be one that eliminates clutch and will provide press-button gear control with some degree of automacity available if the driver wishes to lay it on. Many of these requirements are met by the new system of Hydra-Matic transmission which is now available on exported Rolls-Royce and Bentley cars. If the steering column lever is put into the position marked 4 on the quadrant the engine will, when the car is at rest, transmit torque through a fluid flywheel to a pair of epicyclic trains, the brake bands of which are applied by oil pressure. If the car is accelerated on full throttle the speed-responsive control cuts off oil pressure which counteracts a strong spring connected to the brake bands of second gear, and this ratio is thereupon engaged. When peak engine speed is again slightly exceeded oil pressure is deflected by the control mechanism to uncouple the second gear band and to apply a brake which brings third gear into operation, a similar shift being made in due course into top giving direct drive. With less than full throttle each upward ratio will be engaged at some proportionately lower speed as the oil pressure "brain mechanism" responds both to crankshaft speed and inlet manifold depression. It will be realized that the contrary argument holds good, i.e. if the car is held on full throttle on a constantly increasing gradient downward changes of gear would be made at, say, 65, 40, and 20 m.p.h., depending upon the particular engine characteristics. On a level road with speed controlled by the throttle only the car will remain in top until the speed has fallen to about 15 m.p.h. If, however, the steering column lever is placed in the position marked 3 on the quadrant the fourth gear is locked out, and similarly if placed in the position marked 2 both third and fourth gears are locked out. As the gear lever can be moved with the car in motion it follows that pulling it down from position 4 to position 2 will automatically result in a change from top to second gear, and the driver has therefore complete control over which of the upper three ratios he wishes to have engaged. As there is no clutch there is no clutch pedal, and the cars offer complete two-pedal control.